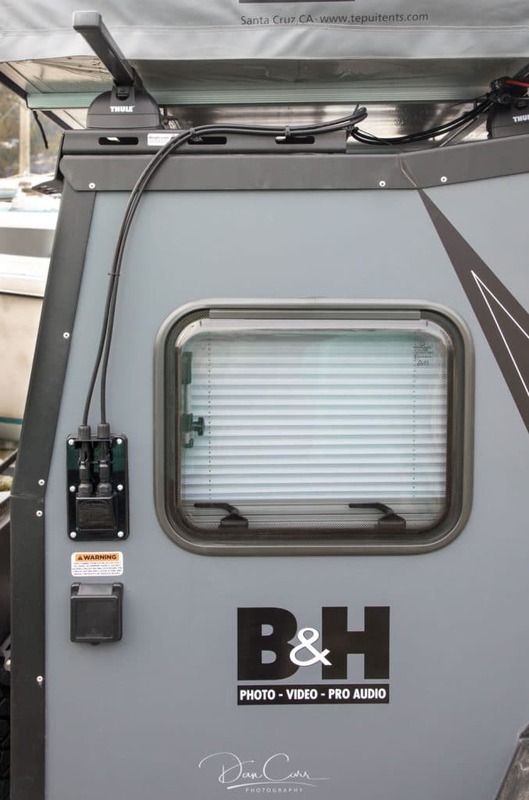 This post was made possible by my friends at B&H Photo, where you can buy the Boulder 100 solar panel that I installed on my Taxa TigerMoth photography adventure trailer. Of course this content is also relevant to any other van or trailer you might be considering for your own adventure vehicle! The Boulder 100 comes with a stand if you don’t want to mount it on a roof. 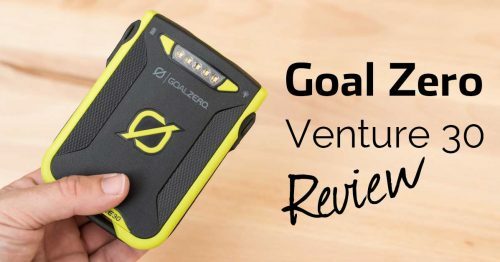 I love the Goal Zero gear and I also love the support that the company provides – that’s very important in my book! 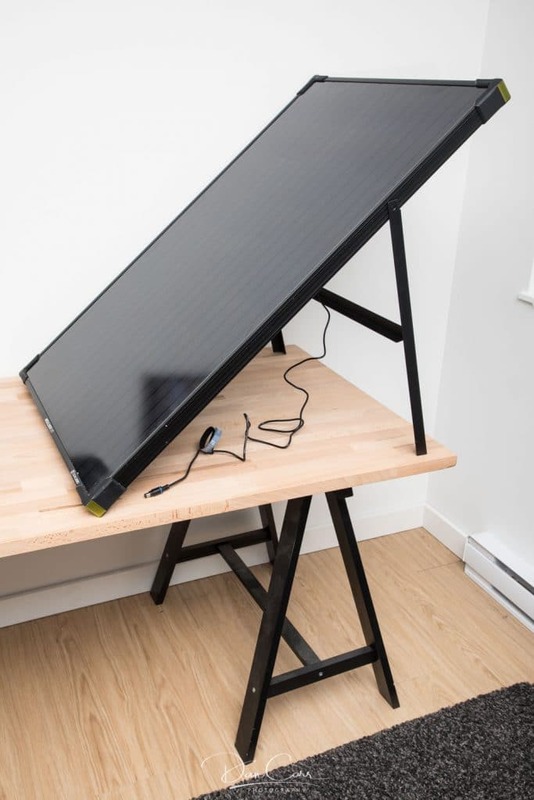 The natural choice to bring a little more power to my setup was the Boulder 100 solar panel, which is the same as my Boulder 50, just twice the size. 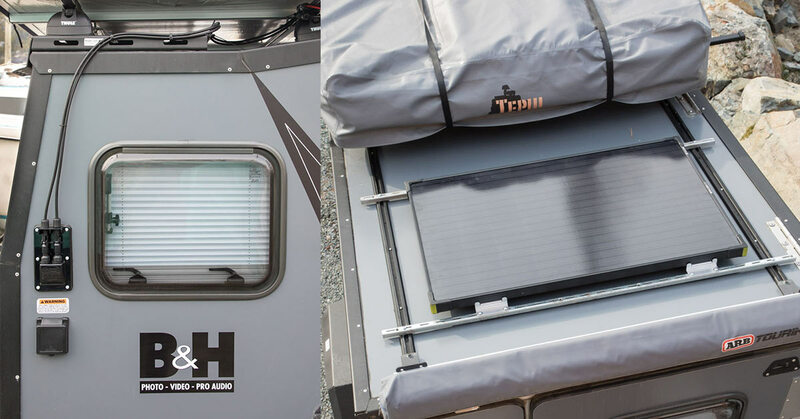 Instead of having a static setup, this time I wanted to mount it onto the roof of the trailer so that it can be constantly adding power to batteries, laptops and camera gear that’s sitting in the trailer when it’s being towed along, or temporarily parked at destinations along the journey. It’s simply not that practical to keep pulling out my 50w panel and setting it up in car parks. junction box. Optional, but a nice way to keep things tidy and weatherproof. 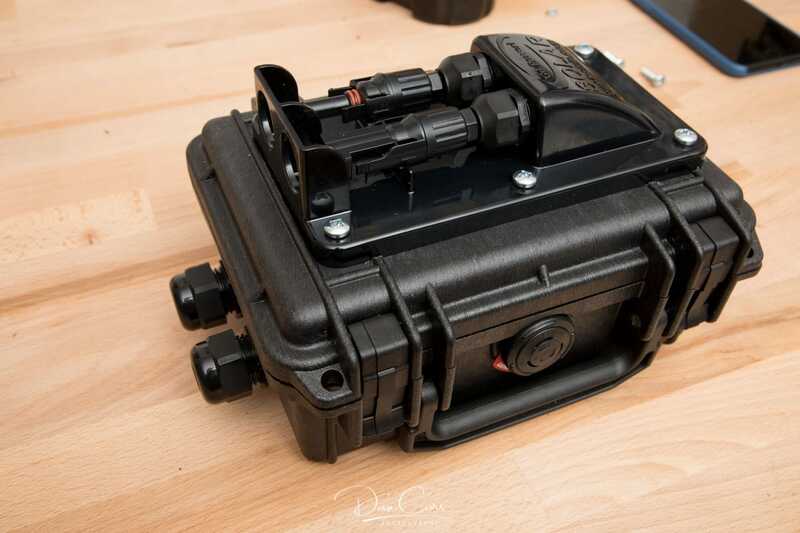 The first thing I did was build a solar junction box out of a Pelican case. 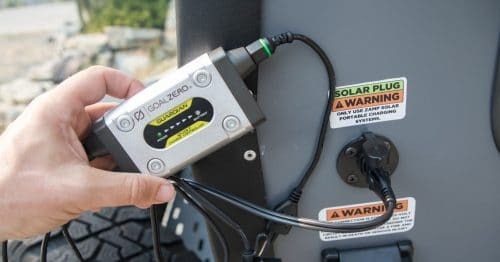 This allows me to connect multiple Goal Zero solar panels to the trailer at the same time, and then pass that incoming solar power through the cable entry port and into the battery that’s inside. 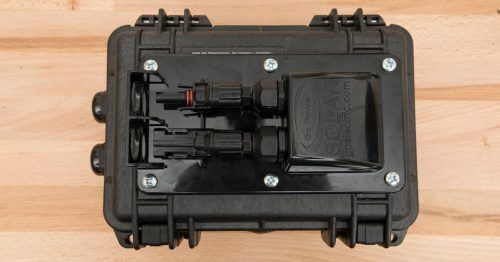 I detailed the build of this solar junction box here in a previous post. 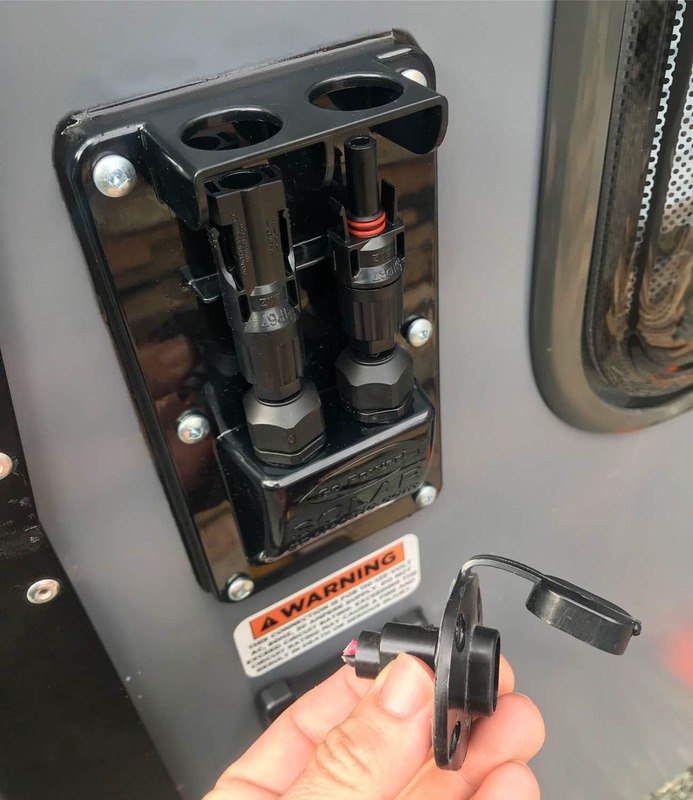 The next thing that I did was remove the Zamp connection on the side of my trailer and replace it with a GoPower cable entry port that uses the much more robust , lockable and waterproof MC4 connection. The Zamp-style SAE connections are ok for static usage, but as it was configured on my trailer, the plugs would stick out from the side which isn’t great if you’re on the move. They’re also not that solid on bumpy ground as they just rely on friction to keep them held together. MC4 connections are the way to go if you want a permanent connection for a roof-mounted panel. Zamp port removed and replaced with GoPower MC4 port. 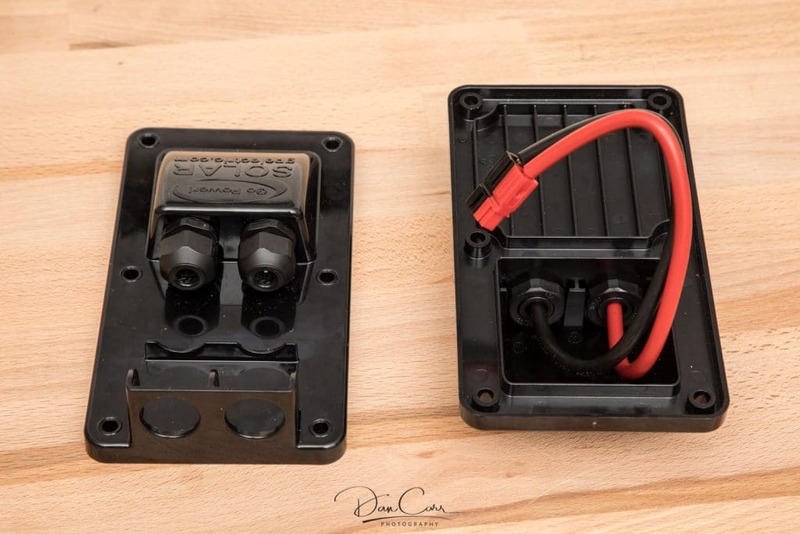 The installation of the MC4 port was simple enough, and I used black silicone to seal the edges of it, just as I did in the solar junction box build. I think it looks great! 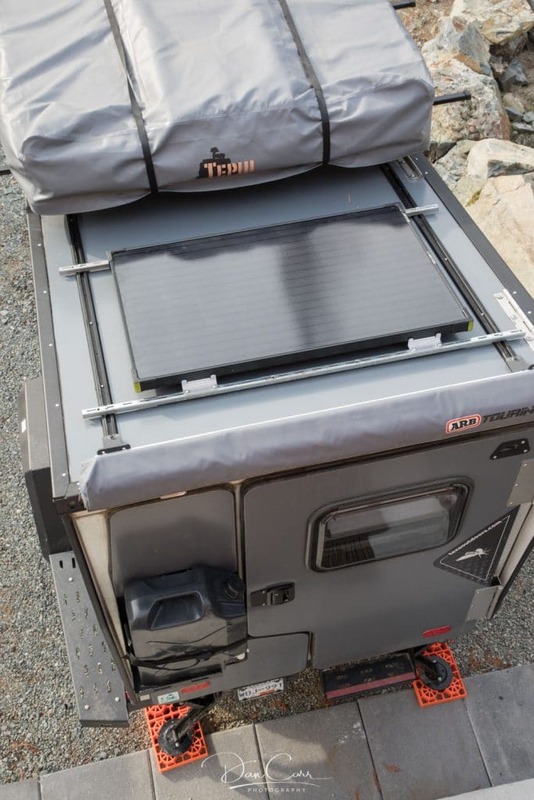 In the previous setup, I would have a solar charge controller on the outside of the vehicle because the solar input was wired directly to the battery. At this point I also re-wired the interior of the trailer to route the new MC4 connectors to my solar charge controller first, before sending the power to the battery. For a permanent roof-mounted setup, you want the controller inside so that you don’t have to worry about weatherproofing it. The next step wast to build a mount for the new Boulder 100 panel. Luckily my trailer already had full length Thule rails on the roof, so I only needed to find some horizontal bars to go on top. I actually picked up a couple of totally random steel bars for free from my local recycling depot. Thule ones might have looked a bit cooler, but I save a few hundred dollars this way and I think it looks just fine! These were mounted to the Thule roof rails using Thule track nuts (park number 853-2106), which Thule kindly sent to me when I called them and asked very nicely! Good stuff Thule!! Next I got a set of solar panel mounting brackets from a company called Renogy. 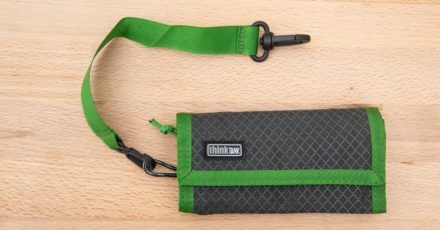 At the time, Goal Zero weren’t selling their own brackets for the Boulder panels, but I have since noticed that they have started to do so, and B&H is selling them now. I wish I’d got these ones as I like the black colour, but maybe I’ll swap them at a later date. For now, the Renorgy ones are fine and they’re a bit cheaper too. Mounting the panel onto the brackets is easy enough, but you go have to drill your own holes in the metal frame of the panel. Measure, measure and re-measure your drilling points before you do this! You’ll want to start with a small drill bit and work your way up to a larger one. Once the panel was mounted, it was time to connect it to the newly installed MC4 port! You can buy pre-cut MC4 cables on Amazon pretty readily, but I decided to buy some 10-gauge wire and a set of MC-4 plugs from Renorgy so that I could make cables that were the right length for my purposes. If you go down this route, you’ll also need to buy this pair of cheap MC4 tools, and make sure you have a good pair of cable crimpers, like these ones that I got from Powerwerx. 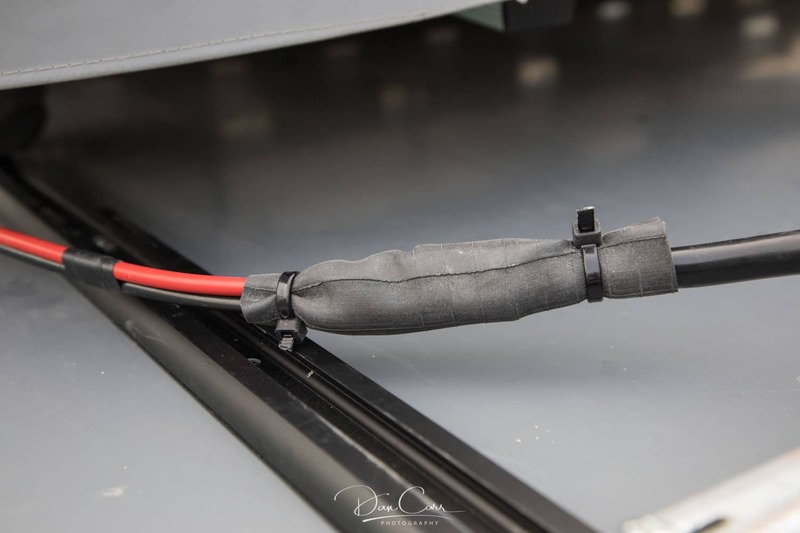 If you do have to have any external wire connections, you can protect them from the elements with some bicycle inner tube and cable ties. It’s also worth noting that not all 10-gauge wire is built equally. The wire gauge relates to the thickness of the copper bundle that runs through the middle of the cable, but it doesn’t describe the thickness or rigidity of the plastic sheathing. You can get some some really flexible 10-gauge wire, or you can get stuff that has a much more rigid sheath which makes it hard to flex. I would recommend using the thicker, more rigid stuff in a roof-mounted panel setup. This will stop the wire flapping around in the wind while you’re driving your vehicle. Once all that was done, I simply tidied things up with some cable ties and plugged it all in! I’m really pleased with this new feature of my trailer. It’s definitely going to make it possible to survive off the grid for longer periods of time, and now I can be collecting at least some power at any time during my travels. It also serves as an excellent way to keep the trailer batteries trickle charging and topped off when the trailer is parked up at home and not in use. Stay tuned for more mods and upgrades to my photography adventure trailer coming soon! Nice article. Well written and the photos are spot-on. This looks great. How does your panel mounting hold up on those bumpy back roads and high speeed interstates? 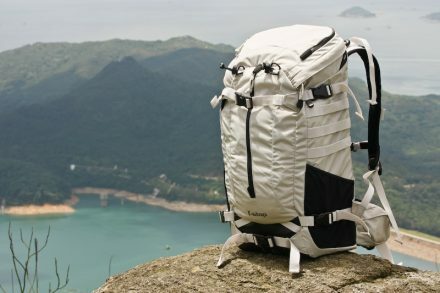 I would not have the wind block of the gear bag infront of it. Thanks- photos and links much appreciated. Interstates shouldn’t be a problem. To be honest, since I installed it I haven’t done many backroads because we’re deep in winter here in BC right now. I don’t anticipate any issues though, and if I do, I’ll add some Loctite to the situation and that should be fine. I have just used your design to re-wire my Goal Zero Boulder 50 W panel with the GZ charge controller. What charge controller did you install with your new set up? Thanks for the write up, great info! What splitter did you use? Splitter? I’m not sure what you mean. I think everything I have used is listed and linked to in this post. You’re perhaps the only camper that I’ve seen a proper looking set of rails and crossbars on! I want to do the same thing for panels, boards and a cargo box. Are the rails drilled directly onto the roof? They must be it seems. Then I’m guessing you used some bolts and washers to secure the brackets down onto that scrap metal. What is essential to this set up mounting flush onto a roof? 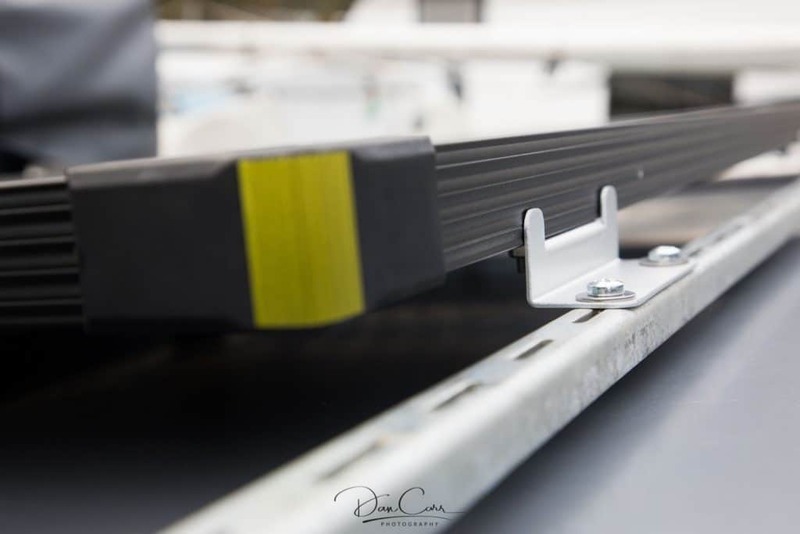 Actually the rails came pre-installed on my Tigermoth trailer so I don’t really have all the details. They definitely bolted it on in some way but I can’t be certain what kind of hardware they used to do it. The rails are from Thule though.